Daisy Buchanan knows what I'm talking about when I write that I've missed the longest day of the year. I was looking for it, and then I missed it. This means that I am lazily, luxuriously, slothfully in the midst of our summer. Our break from the cloud of Matthew's grading mountain, our break from routine, our break from even knowing what day of the week it is. Wait, it's still June, right? I look out the window to our yard, swollen green, sun shining with all its might. This is the image I long for in January when our lawn is a pitiful brown and our garden a sullen blank unblinking square. I know this won't last, this feeling of All the Time in the World, but we spend our days acting like it will--a bottomless cup of blessing. A couple of nights ago, I went out to our garden (once plotted and planted by Matthew's grandfather years ago--so thankful for a growing place, for a legacy like that) and picked our first tomatoes: little Roma/cherry hybrids called Juliets. I clipped two Japanese eggplants (even their stems are a deep royal purple, their skins thinner), and a zucchini (a miracle as we fall victim every year for the JERKS OF THE INSECT WORLD, the squash vine borer). 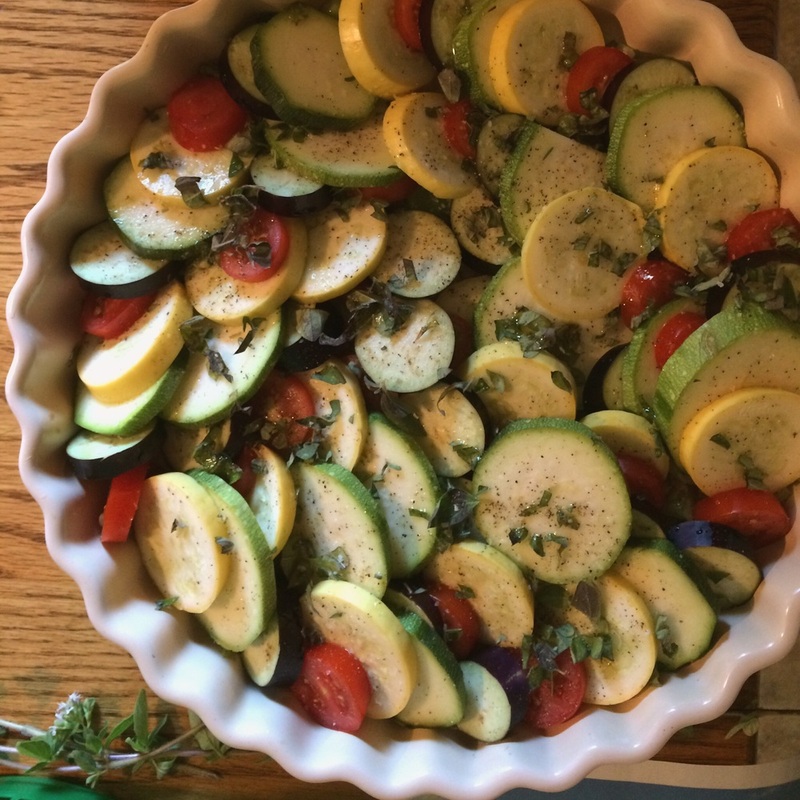 After plucking a handful of oregano, I knew I had in my basket the makings of a vegetable tian--delicious summertime. Such a satisfying, holy thing a garden: a miracle to plant, to tend, to enjoy something that mostly just needs sun and rain and time (ignoring those damn vine borers for the sake of poetry here). As I type here, my "desk" (our kitchen table) crowds with just-paid bills and my desperate calculations on how much we have to live on for the rest of the month (the whole bottomless blessing cup never really tastes like money, does it?) 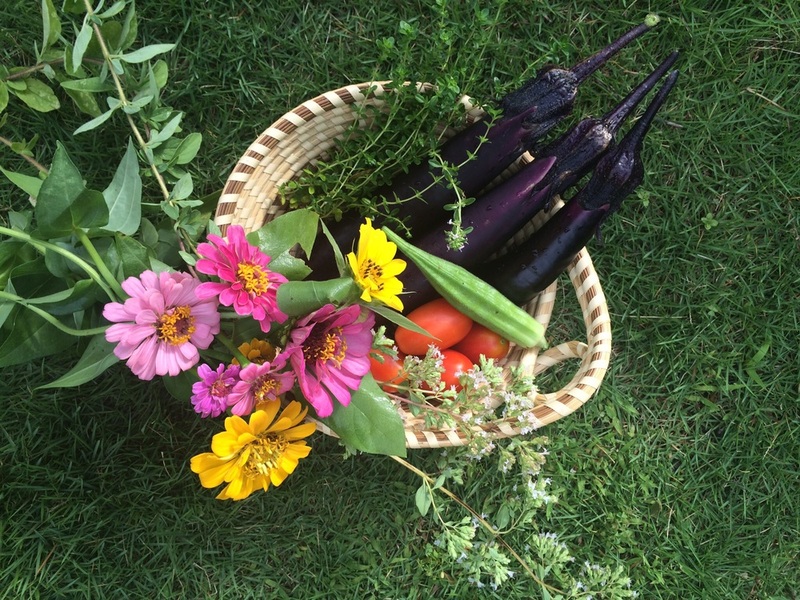 So thinking about our garden, our time, our month of summer ahead--I want to tend to my days like our four plots up the hill: with sun, with refreshment, with mindfulness, with--not much else. I need to figure out what living simply really means. I'm purging my closets--a start. But I want my schedule, my expectations, my spiritual self, even my writing to find a sweet spot in not wanting (which feels a lot like needing) ornamentation and excess. Like the tian. Simple, it's depth of flavor found in cooking time and lack of excess: a layer of leeks (if you haven't had leeks before--this is the best introduction) and garlic, a layer of sliced vegetables, a little olive oil and wine, a sprinkling of oregano. Summertime. Over medium high heat, sauté leeks and garlic in olive oil until soft and just beginning to turn brown. Spread evenly in the bottom of a casserole dish, a tart pan, whatever. Beginning from the outside, layer your vegetables (squash, zucchini, tomato, eggplant) in circles. This is tedious I guess but in a nice mind-numbing way. And oh so fancy looking at the end. Remember, Instagram must eat fist. It's a rule. Pour the wine on top. From out of your wine glass. Refill. Get that thing in the oven. Bake for 30 minutes, drizzle more olive oil on top, then bake for 30 more minutes. Your kitchen will smell so good: like you live in a tiled-roof house in the middle of a lavender field and you are in Provence and maybe you'll start hearing a little accordion music because that's what France is like and whoops, maybe you drank a little too much wine on an empty stomach. This is simply amazing over some goat-cheese grits. Or brown rice. Or quinoa. Make it and taste deeply from the deep mid-summer all around us.